Movie file, “An Enchanted Evening vol.2 by Kitaro”, is available now. 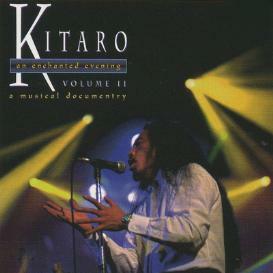 Kitaro An Enchanted Evening Volume II shows the instrumental magic of Kitaro’s compositions combined with an interview footage of the 1996 Grammy nominated composer/producer as being featured on PBS during their March fundraising drive. In the interview segments. Kitaro discusses his inspirations, beliefs and experiences while wandering the terrain of his home in the Rocky Mountains of Colorado. The video also features concert footage from Kitaro’s An Enchanted Evening world tour, combined with excerpts from his famous Taiko drum ceremony at Mt. Fuji in Japan, interviews with concert guests, and snippets from the band on the road, the final product gives an intimate never before seen look at the artist and his work. This entry was posted in Kitaro and tagged "Movie File" "An Enchanted Evening" Grammy "Divine Spirit" Relaxation "New Age" Nature Japan Spiritual 喜多郎 シルクロード リラクゼーション グラミー賞 ニューエイジ スピリチュアル, kitaro, video. Bookmark the permalink. Copyright © 1993 - 2019 DOMO Music Group. All Rights Reserved.